You can not survive without water – simple! It makes up nearly two-thirds of your body and is essential for you to function properly. Your body uses water to transport nutrients and oxygen around your body, get rid of waste products, control your temperature and to keep your joints lubricated so they act efficiently as shock absorbers. If you have severe dehydration, your body stops getting rid of waste products and you may develop kidney failure. Dehydration happens when we lose more fluid than we take in. We lose body fluid and salt throughout the day in sweat, tears, moisture in the breath, urine and stools. Usually, the water and salt content of what we eat and drink makeup for this loss – but we become dehydrated if fluid loss exceeds fluid intake. Our kidneys and intestines work together to control the level of fluid in the body.The intestines absorb salt and water, while the kidneys regulate how much of this is lost into the urine. If a large amount of fluid is lost, then the kidneys may struggle to regulate the balance of salt and water. Dehydration is usually described as mild, moderate or severe according to how much body weight has been lost due to fluid loss. Mild dehydration is the loss of 3-5% of your body weight. It carries few risks and can usually be dealt with by replacing lost salts and fluids. Moderate dehydration is a loss of 5-9% of body weight and is more serious. Moderate dehydration that is chronic can affect kidney function and may lead to the development of kidney stones. This can also be dealt with by replacing lost salts and fluids. Severe dehydration is a decrease of more than 10% of body weight due to fluid loss – is very serious and needs immediate treatment as it can be fatal. You may need to go to hospital and be put on a drip to restore lost fluids. What is the relevance to IBD? The intestines play the biggest role in keeping us hydrated. When we’re dealing with intestinal issues, especially during a flare, hydration often comes into play. The intestines actually work with the kidneys to control the level of fluids in the body. The intestines work to absorb water and salt and the kidneys control what is lost through urine. So when fluid is lost due to diarrhea, the kidneys may have difficulty balancing the salt and water, meaning you also may need extra salt in addition to extra water. For those who do not have a colon, this becomes an even bigger issue. The main job of the colon is to absorb water back into the body. So, while hydration is most often an issue for people with IBD during a flare, it’s a constant concern for those of us without a colon. The colon absorbs 300-400ml of water each day, so without a colon, you lose this automatically. This means that if you have IBD, you need to be extra careful to drink the amount of water your body needs; and if you’ve had your colon removed, you need to be extra, extra careful. You suffer from frequent or watery diarrhoea. You are not drinking enough water, because, for example, you are feeling nauseated or have lost your appetite through illness. You are losing more than usual amounts of water and salt through your skin because you are sweating excessively. This might be, for example, during hot weather or exercise, or because you have a fever. Your urine output is too high. This can happen if you have uncontrolled diabetes, are drinking too much caffeine, or are taking diuretic drugs. You have drunk too much alcohol. Alcohol is a diuretic, which increases the amount of urine you pass. You are suffering from gastroenteritis, a stomach or bowel infection that can be caused by a virus or bacterial infection, or by food poisoning. You have had your colon removed. This affects your body’s ability to absorb fluid and electrolytes (essential salts such as potassium and sodium) from your diet. You have an ileostomy, because output from this type of stoma contains more water than normal stool. If your ileostomy has a high output – a loss of more than 1500ml per day – you are at greater risk of becoming dehydrated. You have a very short bowel as a result of extensive surgery. You have bile salt malabsorption (BAM). This can happen if you have Crohn’s in the ileum (the lower part of the small intestine), or you have had a resection in that area. How can it be resolved? To treat dehydration you have to rehydrate the body. But just drinking plain water may not be enough, because you will have lost sugars and essential salts as well as water. For mild or moderate dehydration you will need to increase your fluid intake and the level of salt in your body. One way to do this is to drink a commercial rehydration solution such as Dioralyte, which are available from pharmacies without a prescription. However as a short-term measure, it can be as effective to drink water or a flat coke drink, and eat a salty snack such as a packet of crisps. If this doesn’t help, or you find you keep feeling dehydrated, talk to your doctor. They may suggest that you make up and drink an Oral Rehydration Solution (ORS). For more serious dehydration, or if you have a high output ileostomy or short bowel after surgery, you are more likely to need more salt than most commercial rehydration solutions provide. So, your doctor or IBD team may recommend drinking an Oral Rehydration Solution with a higher sodium (salt) level. A ORS will taste both salty and sweet and some people find it unpalatable unless they add quite a lot of flavouring. The usual recommendation is to drink the full litre in one day, sipping it slowly to maximise the rehydrating effect. It was developed for people with a short bowel, and may not be as useful for people with diarrhoea caused by other forms of IBD. A similar rehydration solution can be made by dissolving eight sachets of Dioralyte in one litre of water (instead of one per 200ml). This solution will also contain potassium (an essential mineral), unlike a regular ORS. It is particularly important to check with your doctor before taking an ORS if you are diabetic. This is because both of these solutions have a high sugar content and can increase blood sugar levels if drunk very rapidly or in large amounts of more than one litre a day. Your doctor may suggest you see a dietician. you are taking tablets for heart or blood pressure problems. Seek medical help immediately if you think you have become severely dehydrated. The easiest way to avoid dehydration is to make sure that you drink enough water. To keep well-hydrated, the recommended fluid intake in the UK is two litres a day for women, and two and a half litres for men. Eating foods that will help with hydration, like watermelon (without seeds), small amounts of strawberries, and cooked carrots. Add extra salt on food which helps retain water. This can also include snacks such as pretzels, crackers, rice cakes or baked crisps. Drinking coconut water, which is a delicious way to stay hydrated and a great source of potassium! Be aware of situations when you may be more susceptible to dehydration – for example when it is very hot or you are active, as you will lose more salt and water through your skin. Don’t wait until you feel thirsty before you start drinking extra water. Drinks such as tea, coffee and Coke will also help, but because these contain caffeine they are mild diuretics and will make you urinate more. So, such drinks are slightly less effective at rehydration. Sip your drinks rather than gulping them down. This will help you to avoid getting too much air into your system, which can cause discomfort. A balanced diet that includes foods rich in essential body salts (potassium and sodium), such as avocado, bananas and Marmite, can also help to maintain the electrolyte balance in your body. Avoid drinking alcohol, which can make you dehydrated. Make up to 1 litre with water. If preferred, use carbonated water and/or flavour with low sugar fruit squash. Refrigerate and drink chilled. I’ve experienced dehydration with my colon and now without it. Both experiences are not ones I wish to repeat. Most of my pre-stoma dehydration problems happened when I was unwell, in a flare and being admitted to hospital. A couple of occasions it happens right after my Infliximab infusions; as I experienced a sudden rush of fluids which my body quickly chose to remove. That was probably the most scary and fearful I’ve felt with dehydration. In other times, I’ve known that dehydration is going to be an issue – especially if I am being admitted and they need to get a cannula started, which is very difficult! Since my ostomy, I’ve been more careful of dehydration due to these experiences. However, being without a colon and some small bowel, meant until I experienced my first dehydration episode with my stoma, I didn’t know the difference. My dehydration with my ostomy comes on alot quicker, take longer to replenish and makes me feel worse – the fatigue, the joint pain, the nausea and the unbearable headaches. These take only 30-45 minutes to go from manageable – where I should just drink something and have a snack – to an all-encompassing issue which means I need to stop, rest and recover. In those instances and because they come on so quickly; I tend to keep supplies on hand, all the time. These include some small salty crackers, some chocolate bars, some Smart Water and marshmallows. For me, these things help me a great deal. To avoid dehydration I aim for almost 2.5lt per day. In the current summer heat wave we are experiencing, I’m finding that isn’t enough and so now I aim for just over 3lts per day. It does means that I pee alot – which is a good sign! – and I always feel refreshed. 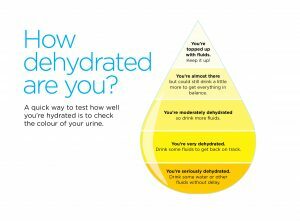 I know due to past experiences, dehydration admits to hospital are not fun – I had two last summer, but that eventually turned out to be an oncoming flare up! – so I would prefer to deal with it myself and know I can do my best to keep hydrated. I always balance out my caffeine intake with one cup of water. I also always have a small snack every 2 1/2 hours to make sure my stoma output stays consistent – neither watery or thick. It is important to remember that whilst you have a chronic illness and it might mean you do things slightly different to those who are healthy, you are just doing what you need to do to keep your own body functioning like it should. Have you ever become dehydrated? How did you cope? What did you use to resolve it? Have you ever been admitted for dehydration issues? Do you have any questions or queries? Or just want to share your own experiences? Leave me a reply or tweet me @sapphire20 or find my blog page on Facebook!